Since the turn of the millennium, Roman Saenko from Kharkiv, Ukraine, has proven to be one of most gifted and prolific black metal musicians out there. His work with Drudkh is widely known, influential and amongst some of the best black metal ever conceived, though he's not been afraid to step out of said genre and experiment with Dark Ages, Old Silver Key and Rattenfänger. 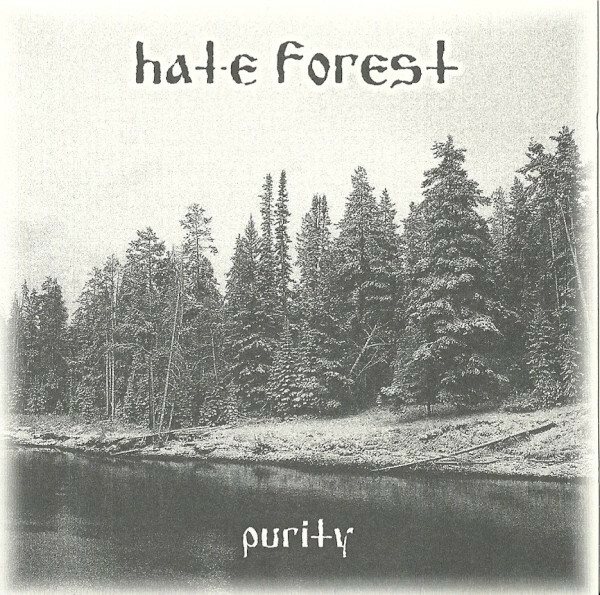 Hate Forest (who'd later on morph into Blood of Kingu in '05) is however his oldest known band, which dates back to '95, but didn't release anything until '99 in the form of a demo tape titled, 'Scythia.' 'Purity,' the band's second full-length after numerous EPs and the debut, 'The Most Ancient Ones,' was released in '03, and although I haven't heard the bands other work, I'm not stopping short of calling this one a modern masterpiece. Hate Forest combines demented speedy tremolo riffing, merciless drum blasting akin to Immortal's, 'Battles In The North,' brief synth flourishes and deep gravely growled vocals quite unlike any I've heard before. Perhaps one of the albums most outstanding qualities is the relentless driving force behind this beast. Some short moments of ambiance are found, but largely the listener is assaulted with what feels like nearly forty four minute's of gapless nonstop commotion. The songs are not especially different though, but quite early on a hypnotic state is achieved through the highly atmospheric and dare I say dreamy riffs, percussive brutality and guttural roars. Personally I find my feet mimicking the double bass drums as I listen and become increasingly energized and possessed as the album continues. Interestingly adding to the atmosphere there seems to be a low end synth bit, that although not always audible, is there from time to time and naturally it increases the trance-like qualities during the more repetitive portions of the album. There's even bass guitar poking through now and again. 'Purity' is quite a fascinating record, especially considering that at its core its just high-speed raw black metal. Yet, I don't find the album to be particularly dark or evil in character, no, it has a rather glistening sort of essence that you'd likely find in some sort of epic or Viking metal themed band. It also easily creates the cover image perfectly; it doesn't take long before the snow covered forest appears, looking further ahead mountains high as the eye can see, followed by the... the unknown - this is simply stunning! As I said, this is my first venture with Hate Forest, but I look forward to getting my hands on their other records, as well as pretty much everything else Mr Saenko has associated himself with.